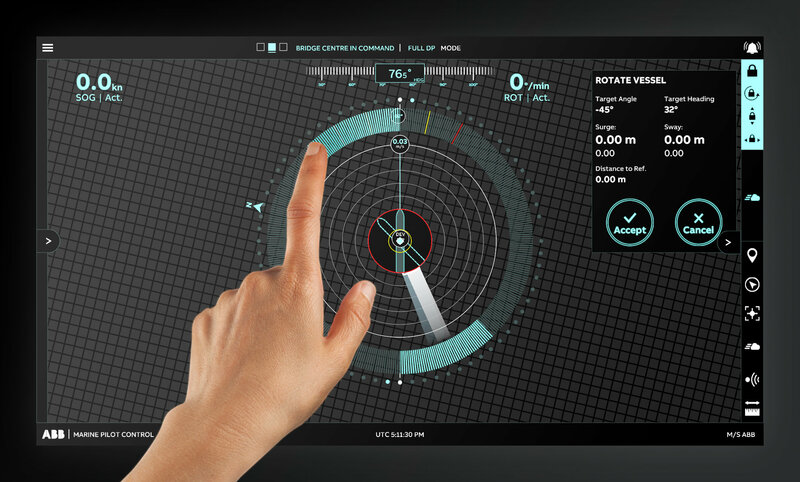 05 September 2018 – The ABB Ability™ Marine Pilot Control dynamic positioning (DP) system, unveiled at the maritime trade fair SMM, simplifies ship maneuvering with an intuitive touchscreen-based user interface and enables safer, more efficient ship operations. With its user-centric design, ABB Ability™ Marine Pilot Control reduces the workload on automating navigational tasks and allows bridge officers to focus holistically on the overall control and positioning of the ship. The system integrates seamlessly with existing onboard equipment and ensures ease of installation and maintenance, adding significant “bridge-to-propeller” value for the shipowners. One of the key benefits of the new system is that it allows the operator to switch to joystick control for maneuvering the vessel at any speed and all the way to docking. ABB Ability™ Marine Pilot Control employs algorithms that calculate the optimal way of executing a command for controlling the vessel in any operational situation. The overall safety of the operation is increased as the crew is able to maintain full situational awareness, rather than having to focus on changing control modes.